A significant portion of the United States populous owns an HDTV. I would ask you to take that item and imagine a more immersive experience. Imagine being completely enveloped in HDTV, with supporting sound and effects. Can you conceive what Avatar would be like? Or Gravity? Life of Pi? Inception? Imagine being immersed in a world with that level of crispness and awareness for a year. How awesome would that be? Now take that away, head down to your grandparent's basement and find the old black and white cabinet TV and turn on I Love Lucy. Would you yearn for the HD experience? Could you tolerate the black and white? Could you learn to love the black and white? Now imagine trying to explain the HD experience to people who've only experienced the black and white cabinet TV. What words would you use? Could you even make the attempt? Unfortunately, this scenario is what a significant number of our veterans go through when coming home from Iraq, Afghanistan, or any other area of conflict. They come from an HD experience, where crispness and clarity contribute to life or death decisions, and return home to a black and white existence, which requires a significant change not only in their day to day life, but in their very fundamental perception of the world around them. They were in a world where every detail, sight, sound, smell, sometimes taste could mean life or death, so they learned to be hypersensitive. Then they return to a life of comfort and luxury, where the hypersensitivity makes no sense, and the people around them have no concept of what they lived through and what they gave up to come home. The friends and family want to help, but they lack the context to even understand what the soldier left behind, and the veteran wants to share, but can't or won't because the family might not understand the environment, doesn't want the family to judge because of the actions taken, or he/ she wants to save the family from the horrors experienced in theater It's hard to find meaning behind paying bills and cheering at kids baseball games, when earlier you were dealing with bullets, explosions, and screaming friends. Compounding the issue is the understanding that all veterans have: that so long as we are in the service (and sometimes even after we think we are out), we can go back again, and again, and again. So the skill sets and hypersensitivity earned in the Sandbox (Iraq) or Mountains (Afghanistan) are not so easily released because we know we will need them again when we go back. I almost think we did our servicemen a disservice in letting them return between deployments. In WWI and WWII the servicemen stayed until the war was over, allowing the men to largely compartmentalize the experience and leave it behind. In Vietnam and Korea it was less clean; but, for the most part, once you hit your DEROS (Date of Expected Return from Overseas) and came home you were home (I won't say more on how the political environment and the reception upon returning home compounded the PTSD issues for those veterans; that would be another article). It may have been considered a break (by the civilians), but many of us who knew we were heading back saw the return home only as an opportunity to get sloppy, adding more stress to the home front. In addition, it wasn't really a break because we found ourselves on training rotations to get ready for the next deployment cycle. Over and over exposed to pseudo-real combat situations, but expected to go home and sleep in a comfortable bed and act "normal" around our friends and family. Who could live up to that expectation? Further compound that by the individual horrors most civilians only experience through the sterile environment of a video game or movie, and you can understand why these military men and women are having a difficult time relating to their civilian friends and family. The veterans love the friends and family, but can't let go of the HD experiences and can only relate to people who have lived the HD experience. The Hurt Locker (for as many flaws as that movie had) got this issue right. Staff Sergeant (SSG) William James kept volunteering to go back to the front lines because it was the only place he felt alive, despite the family that wanted and needed him at home. This is the case for many veterans. Other veterans seek to feel alive through other stimulus, by becoming adrenaline junkies or drug junkies. Whether a substitute is found or not, a veteran can eventually find his / her way into depression, with the worst result being 22 soldiers / veterans taking their own life on any given day. Overall not a pretty picture. There are many organizations trying to help, and last week I met a hero stepping up to do more than his part. 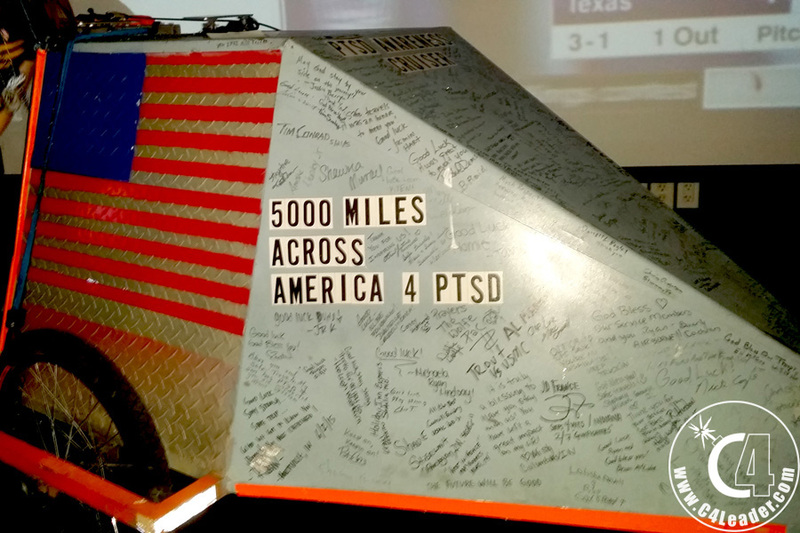 Marine Ryan Weldon started in Delaware on Valentines Day 2015, with the goal of walking across the country to San Francisco to help raise awareness for PTSD. 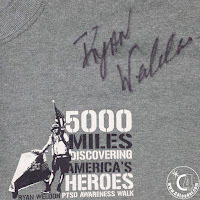 A local radio station (94.5 the Buzz, specifically the Rod Ryan Show) in Houston, Texas was made aware of Ryan's trek and unofficially adopted him, performing SITREPS (Situation Reports), call ins, and Fund Raising for his journey. Ryan was so honored by the response that he decided to make a detour from the straight line shot in order to visit Houston. On Monday the 24th a phone conversation went out on the air that Ryan's push cart (for his supplies) was busted between Dallas and Houston, and he needed help. Hundreds of emails and phone calls poured into the station offering help (including my own). The station picked a man named Ace who (although not a veteran himself) worked with a lot of Marines in a machine shop in Houston. The shop offered to either repair his car or build him a new one. 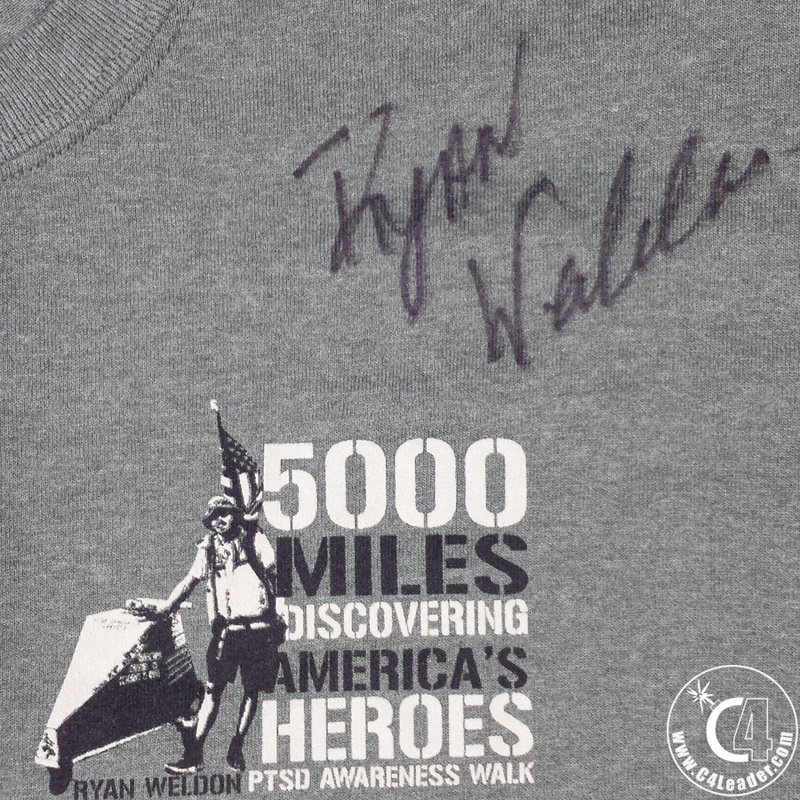 Autographed T-Shirt from Bull Shirts! 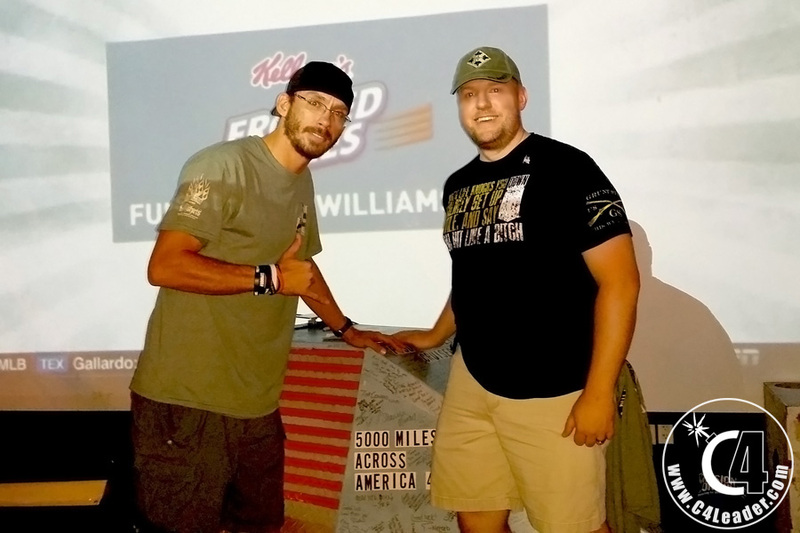 Later that week, Rod Ryan organized an event at a local pub to show support, do some fundraising, and provide an opportunity for the community to interact with this hero. A wide variety of veteran service organizations attended (I will post a list with contact details at the end of the article). Veterans from all over the city arrived to show support. Bull Shirts donated special commemorative shirts for the occasion, which Ryan was more than willing to sign. The machine shop repaired his push cart and are in the process of making a new one for the second half of his journey. People donated power batteries, LED light wraps, safety vests, and all types of equipment, and Bull Shirts offered to provide a decorative wrap around the cart. Ryan honestly appeared overwhelmed. Toward the end of the night, I was able to snag Ryan for a quick Periscope, which started with Ryan, but continued to interviewing many of the organizations that were present that night (sorry for some of the sound issues, it was a loud pub!). I'm hoping that he and I can do a Blab before he leaves Houston. If you would like to help by donating to complete his journey, a link can be found here. I hope many of my readers are willing to give a little. PTSD is a serious threat to the people that sacrificed for our country. Whether you agree with the wars or not isn't at issue. These people stood up and said "I will go, I will defend, even if it costs me my life." It's the politicians who decided where to send these brave men and women. We owe them more consideration than they are given, and should be doing everything to ensure they can come home and adjust to the black and white many consider "real" life. 22 servicemen / women / veterans die a day at their own hands. In 2013 and 2014, suicide surpassed combat as the leading cause of death for that community. More than 3000 veterans have taken their own lives since 9/11. We have to reach out and support this community of heroes that made it home physically, but are still struggling to make it the rest of the way home mentally.